What espresso coffee beans, coffee pods and other products do we supply? What espresso coffee bean blends do we provide? 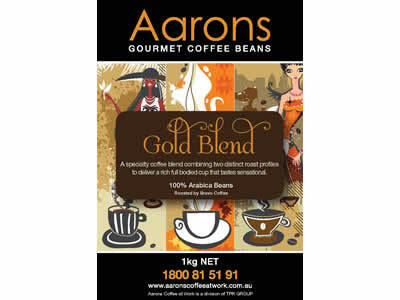 Aarons Coffee Gold Blend: The blend combines two distinct roast profiles to deliver a beautiful rich full bodied cup that tastes sensational. 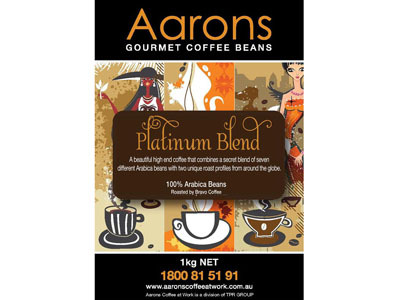 A medium to dark roast and extremely aromatic with delicate fruited flavours, this coffee is perfect for all coffee styles. Available in coffee beans and coffee pods. 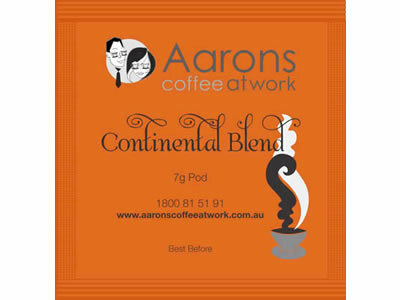 Aarons Coffee Continental Blend: The blend is a slightly darker, medium coarsed coffee that is well balanced with an excellent caramel-like sweetness and overall richness – a distinctive rich flavoured coffee that suits the coffee connoisseur. Available in coffee beans and coffee pods. 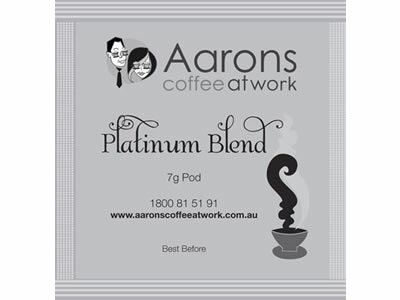 Aarons Coffee Platinum Blend: A beautiful high end coffee that combines a secret blend of seven different Arabica beans with two unique roast profiles from around the globe. Stretching from the mountains of Brazil to southern Ethiopia this blend is a wonderful medium soft bodied coffee with a residual sweetness. Enjoy a truly smooth creamy coffee that is sure to impress any coffee lover. Available in coffee pods. 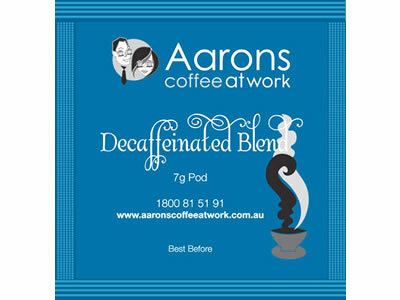 Aarons Coffee Decaffeinated Blend: Swiss water process. 100% chemical free. Available in coffee pods. The blend is a quality 5 bean mix: Colombian Supremo, Brazil Cerrado, Indonesian Mandheling, Guatemala Antiqua and PNG Kimel. 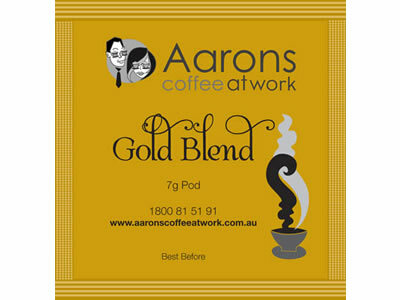 The blend is a 5 bean mix: Colombian Supremo, Indonesian Mandheling, Papua New Guinea Kimel, Java Kayumas & Tanzanian AA. The blend is a secret 7 bean blend of seven different Arabica beans with two unique roast profiles from around the globe. 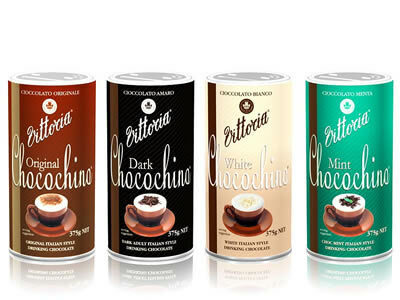 For an added indulgence sprinkle your cappuccino with Vittoria Chocochino, available in Original, Dark, White and Mint chocolate. 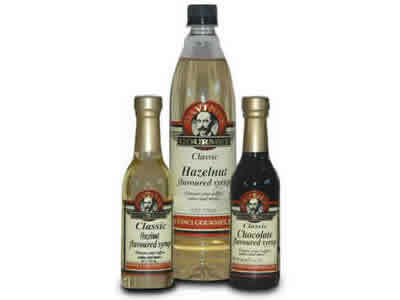 Why not try coffee enhancing syrups as something special for your team or clients? Choose from French Vanilla, Hazelnut, Irish Cream or Caramel.